All champions have to start somewhere and quite often it is at the bottom. – Bonny Warner, an American Luge racer who competed in 3 Olympics. And so began my three year stint at Loughborough University as an undergrad pursuing Sports Science with Management and training as a decathlete. Firstly I would like to thank my friends who turned up to send me off at the airport. My social life was in flames back then due to my work but you guys insisted on coming. Once again it was that small gesture that made the difference. I’m not the particularly sociable type that have a gazillion friends (heck I even only just gotten Facebook a few months ago), but for the friends I have and hold dear to me (whether they were at the airport or not), I’ll be the first one to stick my neck out for them if need be, because I know if it boils down to it, they are going to do the same for me. Thank you all and each of you continue to inspire me. It was also by coincidence that I met Ron Koh, a Singaporean discus thrower, who came to Loughborough University the same year to do his Masters in Sports Sociology and continue training as a discus thrower. I must say I was pretty much a fish out of water when I first got here and you eased me into training with the discus group initially and subsequently from there I got to know the other training groups, coaches and decathletes. So thank you Ron, I owe you a big one. So how would I describe my experience at Loughborough University training? Dream, meet Reality. Reality, stop smacking Dream. Loughborough University is like a Mecca for sportsmen. Down here you could take a pebble and throw at someone in a crowd and you’re likely to hit an Olympian, Paralympian, World Champion or championship finalist, GB or some other nation’s athlete who’s visiting. The facilities were mind blowing as well. I’ve never seen such a big gym in my life, there were loads of rugby, football and cricket pitches. The athletics stadium (as seen on my blog’s header picture, I took that shot one snow cover day recently) had this amazing building that housed a 120m indoor track, another gym and indoor training areas for every single event (yes you can even throw the javelin indoors into a net.) The athletes and coaches here were the real deal and to quite simply put it, some of the best in the world. And there I was, someone who never ran competitively for the 100m, 400m, 110m Hurdles, 1500m events; never did a spinning discus throw prior; and have never ever in my life tried the long jump, high jump and pole vault, in a sea of amazing athletes, trying to become a decathlete. What was difficult at times was getting over the embarrassment and self-consciousness of how amazingly inexperienced I was. The training groups here, even the ones just with student athletes and not elite ones, were of such high standards that someone new like me found it quite difficult to join. Moreover, I found out that there was no decathlon coach at Loughborough Uni and the decathletes here just joined the different individual groups to work on the technical events. But step by step, I started and I tried. I told myself to get on with it, swallow my pride, hide my embarrassment and start learning. For the pole vault event, as the other training groups were all jumping over 5m or so, I found a training group from the community club that trains at the stadium for kids. And there I was learning to pole vault along with 8 year old kids (which to be frank was really enjoyable and the kids were lovely). I really must thank all the coaches, teammates and friends that I have met here in Loughborough. They took me in under their wings, coached and help me along the way, alongside the best athletes in the world, despite having to spend time teaching me just the very basics. I am truly forever grateful and will do up a proper post or page to thank each and every one of you. Down here being an athlete was not just about the sport; it was a way of life. I saw people in their 50s take up a new sport such as throwing the hammer, I’ve pole vaulted with an amazing 72 year old guy and ran along with kids just starting out at the sport. Disability sport is a big thing here too, with my discus coach Jim Edwards working with many disabled athletes. Down here, people do things just because they enjoyed doing it. You don’t need a medal, competition or money as reasons to do things. You just need to love what you do and do what you love, and the rest is easy. That said, I was here with a goal and I wasn’t getting along very far with it. Things were going in the correct direction but at a pace that was frustrating. I kept getting injured as my left knee was still not strong enough and learning the new events meant stressing different parts of my muscles that were not very well developed. I missed my original goal of completing a decathlon in my first year as I was far from being physically fit enough or technically competent to even attempt it. Frustrated with my lack of pace I stopped updating Tony Buzan about my progress as I felt I must have been quite disappointing. But despite the frustrations I went ahead and kept trying anyway. In my second year, things actually started to pick up and started to go quite well. Until one day in winter after a testing session that left me in high spirits (I managed to get second in my training group for standing broad jump, jumped 2.98m, only losing to William Sharman who jumped 3.34m. But then again he got 4th in the World Championships for a reason). As I was cycling back to the track for my evening session, I did not realise that the roads were actually covered with black ice. I took a turn and my bike just slipped off beneath me. I quickly bailed from the bike and landed on my right foot, which for some reason found traction at that exact part of the ground. So the bike and my body went one direction, and my foot stayed stuck in the other. I felt the most horrible crunch in my ankle and I instantly knew that it wasn’t going to be pretty. That injury took me out for 12 weeks (it was a horrible sprain with a slight dislocation) and when I could run or jump properly again, I had only 8 weeks left before the decathlon I planned to do. Regardless, I sent in my registration form and decided that I would do it anyway. 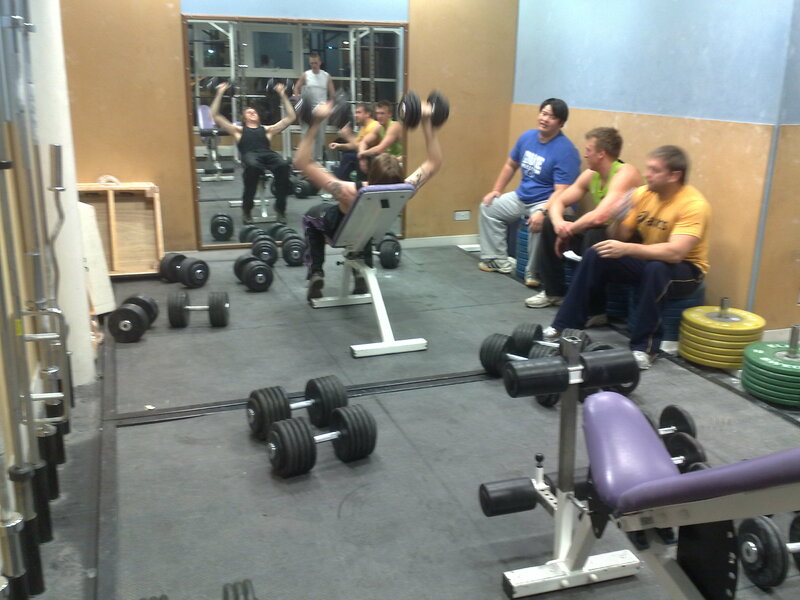 Weights with the Discus crew (2008 at HiPAC gym), thanks everyone! Ron Koh (in blue shirt). Jump forward to Part 4 or Part 5. Jump back to Part 1 or Part 2.